If you're looking for a one-step setup for cleaning your firearm, a cleaning kit is a great place to start. And as you can see, grabagun.com has you covered. With hundreds of choices of cleaning kits, we're certain we have exactly what you need. Have a single particular weapon you need to clean? We have kits engineered for specific guns so you know you're getting the right kit for your firearm. Have multiple guns that need your attention? We have go-to universal kits which will give you an assortment of tools to choose from to suit most purposes. When it comes to cleaning, grabagun.com has every product you can imagine, and probably some you've never thought of. These cleaning kits have handy little cases that make your cleaning products easy to store and easy to transport. 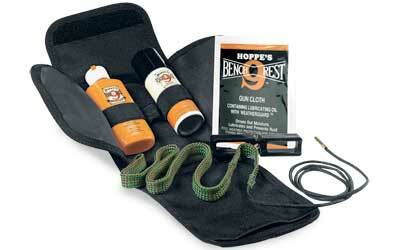 These kits are perfect for taking to the range and doing a quick bore clean when needed. They are useful to have around and make for perfect range bags. You can just keep one of these cleaning kits in your shooting bag and clean your weapon right there at the range when you're finished. They are incredible values for the quality of the products they contain. All of the kits at grabagun.com are low profile multitasking tools that we recommend for all serious firearm users. Choose a kit that fits your gun, or choose a multifunctional kit that suits your cleaning preferences. Our multifunctional cleaning kits offer a great deal of value for the price, and an impressive range of caliber accommodation. And all of our kits are arranged in neat, expertly-crafted and well-organized cases. Either way, trust grabagun.com to inspire further confidence in your weapon of choice by helping you to keep it in top working order.